LAHORE (Web Desk) – Whatsapp users all over the world have been facing a newly discovered scam on the internet messaging app. 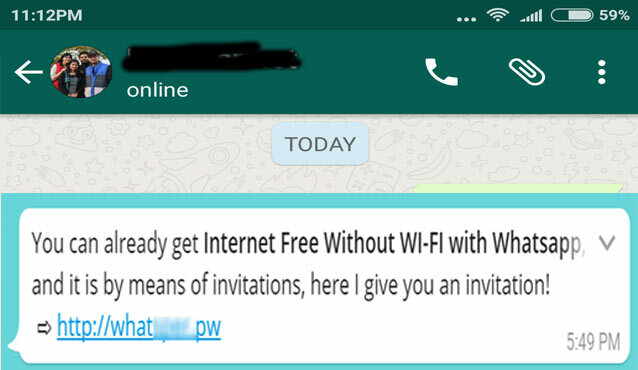 People are receiving spam messages that offer them free internet without WI-FI. It may sound impossible at first but there are certain people who get tempted and thus face problems. After someone clicks this link, they enter a browser page which detects the language of communication in device and asks questions from the user while showing fake reviews saying the free internet thing actually works. The app steals important data along with using the device to send the invitation link to other people in contact list and chat groups. People from different countries who speak different languages are tricked into visiting the browser link. Such unknown and doubtful links should always be avoided for safety reasons. These misleading invitations spread quickly and break out from user to user.